She has very pale skin and beautiful blonde hair that accented the divine features of her face. She is the model of perfection. Beautiful! No! Stunningly beautiful! No! Magnificently stunningly beautiful! It is useless to attempt to explain her ravishing beauty because words would simply never do it justice. Her lips are the color of roses, her eyes, the color of the bluest sea, her hair blonder… well it's so blonde almost to the point of being white. Her body was sinuous and well shaped, her breasts perfect in size, her waist induced splendor at its very sight. She was a magnificent woman, in every respect. Christy can be described as talkative and annoying. She is one of those special people who is able to conjure up a conversation out of nothing and is able to ramble on continuously without end. She has a sense of humor, which others, depending on who is involved, either find extremely amusing or down right aggravating. She is a hyper active, bouncy, gleeful woman who is excited about living her life to the fullest. Hair, jewelry, girly things, pink, cosmetic products, clothes, popcorn, movies, good luck charms, talking, casual conversation, dating, men. Christy was born in San Francisco, California on May 7th 2360. She was a spoiled young lady and her and her sisters lived a lifestyle of luxury for their entire childhood. She was a well behaved girl, but she always liked to talk, maybe a little too much for her own good. She got in trouble for it a lot as a kid, but she was generally well liked by her comrades. That all changed when she entered high school. She started liking boys and things went down hill from there. She had the looks that every man desired but her talkative and annoying personality made her far less attractive to her potential suitors. 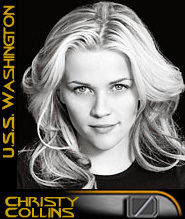 From 2382-2384 Christy attended Starfleet Academy where she studied Engineering for two years. She really had no interest in Engineering; in fact she picked her subject of studied randomly. Christy wanted to get out of the house and away from her life of comfort. She was assigned to Utopia Planitia where she served for several months until receiving the news that she was going to the USS Washington. She was a bit disappointed about her posting because her quarters were too small. Yet she was away from home, so she was happy.